The World Series starts tonight. If you haven’t been paying attention, Kansas City is 8-and-0 in the postseason. The Royals are coming off of pretty stunning sweeps of the two best teams in the American League after returning to the playoffs for the first time since their World Series victory in 1985. San Francisco is back again, for the third time in five years, after winning the World Series in 2010 and 2012. The Giants reached the World Series this time with a five-game win over St. Louis, wrapping up the NLCS with a three-run walk-off home run by Travis Ishikawa in the bottom of the ninth. The guy who caught the home run ball gave it back to Ishikawa the other day. “Ishikawa is the guy who hit the ball,” explained lifelong Giants fan Frank Burke. “I’m just the lucky guy who caught it.” Burke was taken down to the clubhouse and handed the ball to Ishikawa, who gave him a signed bat in return. Burke also asked if he could get tickets to the World Series, and later received four for Game Three, which will be the first to be played in San Francisco. I like to think I would have done the same thing … but I don’t know. I remember when the groundskeeper who caught Mark McGwire’s record-breaking 62nd home run ball in 1998 returned it to him for nothing, even though other balls from the home run race with Sammy Sosa had already been sold for thousands of dollars. I remember thinking then that I would have liked to do the same thing … but soon McGwire’s 70th home run ball sold for $3 million! Then there was that epic battle in the stands, not to mention the courts, over the ball a few years later when Barry Bonds broke McGwire’s record. The market for home run balls (like everything else!) seems to have dropped considerably since then, but the mania for baseball memorabilia dates back a lot further than the sports card craze of the 1980s and ’90s and the home run daze of the ’90s and early 2000s. In 1911, Frank Baker of the Philadelphia A’s hit home runs against the New York Giants in back-to-back games of that year’s World Series, and became known ever after as “Home Run Baker.” Baker’s first home run, in Game Two, went complete out of Philadelphia’s Shibe Park and landed on Twentieth Street. It was scooped up by a red-headed boy, who grabbed it and ran off with a policeman (who also wanted the ball) in hot pursuit. Obviously, the ball had some value. “Returning visitors say that the rage is still on. They claim you can see the identical ball in any portion of Philadelphia. Also that it is on exhibition in the suburbs. Some say that it has crossed to the Jersey Shore. Depending on how you choose to calculate inflation, that would range from as little as $750 to more than $24,000 today. Not quite $3 million, but still a nice little racket! Home run balls that cost thousands?!?!?! I should have honed those baseball skills when I was younger! Amazing how much memorabilia can cost. 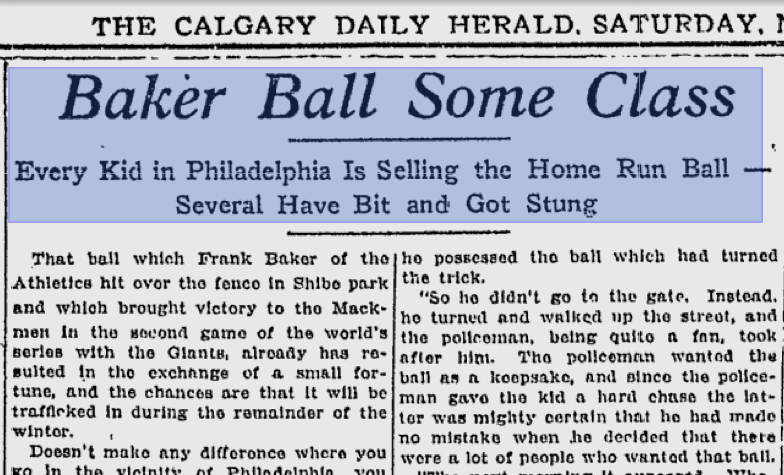 Thank you for an informative blog; I must go catch a ‘home run’ ball now…..